Coaches, has this ever happened to you? An adult you’ve never seen before approaches you at practice, engages in small talk and then asks if you are looking for players. This adult then proceeds to tell you how good his son or daughter is, how they can play any position, etc. When I coached, I had this happen to me several times. The first time it happened, I got really excited. I already started thinking where I was going to place this superstar. It turns out the place was not as good as advertised. In fact, the opposite was true. He was not very good and did not make the team. The second time this happened, I tempered my enthusiasm quite a bit. Good thing I did as the player’s abilities did not live up to the parents’ billing. One definition of the word ‘bunk’ is: n. empty talk; nonsense. A new definition I have for the word ‘bunk’ is: v. over-promote and exaggerate one’s personal or another person’s true abilities. For several reasons, I strongly recommend that parents don’t engage in this type of conversation with a coach. Most parents are unable to objectively evaluate their child’s athletic ability. In all likelihood, your son is not going to be the next David Beckham. An inexperienced coach is expecting the next David Beckham. When David Beckham does not show up, the let-down will be greater given the unfulfilled high expectations. You always want the coach to be pleasantly surprised, not disappointed. As a coach, I may now be concerned that I will have to deal with a parent who may not be satisfied unless his son is seen as the superstar and plays a big part on the team. Do I really want to deal with this potential headache? My advice is to always let your child’s playing ability do the talking. Don’t set any unrealistic expectations or unattainable benchmarks for your child. Simply tell a coach you have a child who you would like him or her to evaluate. That should be it. Congratulations Ghana! To beat powerhouse Brazil playing a majority of the game down 1 man … well deserved. With Ghana having qualified for the 2010 World Cup in South Africa, July 2010 can’t come soon enough for the entire African continent. The game came down to penalties. Brazil had an opportunity to win but could not convert when it counted. The result of this game reinforces an earlier post about penalties. They have to be kicked on the ground, with decent force, and hit the side netting. Otherwise, a player and team is asking for trouble. I have embedded a video clip below and below it, I have added my commentary along with the time the kicks appear in the video and a score for each kick. There is no video with all the kicks but the video I have shows all the misses. Best Brazilian penalty in the shootout … hard, on the ground, and hit the side netting. The goalie guessed correctly but never could have saved the kick (Score–10). The kick was high. The Brazilian goalie guessed correctly and actually got his fingers on the ball. Because kicking the ball high into the net has the danger of going over, the score is lower (7). Same comments as the previous kick (7). The kick was once again high but had the goalie guessed correctly, the kick could not have been saved. (8). Same comments as the previous kick (8). Terrible kick. It was 1 foot off the ground and worse, only 4 feet in from the center of the goal. My 94-year old grandmother would have saved that kick (1). Just an average kick that was saved. Once again, it was 1 foot off the ground but not close enough to the side netting. The Ghanaian keeper started to employ a clever tactic because his team was down and he needed to make a save. Just before the kick, he took a big step to his right. By guessing correctly, he was able to make the easy save (4). Another poor kick. It was slightly better than the previous Ghanaian kick because it was on the ground and a little further toward the corner. But there was not much force behind the kick. My 94-year old grandmother would have had trouble with this kick but my 10-year old would have saved it (3). This one was for the Championship but the Brazilian kicked it over the goal. As I have posted before, you can’t kick the ball over the goal if the ball is kicked on the ground. I’m willing to bet that Maicon was worried that the goalkeeper was going to take that same big step before the kick and therefore felt it necessary to kick the ball higher. Once a player changes how he/she is going to take the penalty, the odds of a miss increase dramatically. In this case, had the penalty been a kick on the ground and into the side netting, Brazil would have been the Champs (3). With all the pressure on Adiyiah, he scores. The penalty was similar to Ghana’s first kick but because of the pressure, I’m giving it an extra point (8). Brazil’s third miss in a row. The kick was about 2 feet off the ground and halfway between the center of the goal and the post. Once again the goalie took 1 big step in the correct direction and saved the penalty easily (3). Badu saved the best Ghanaian penalty kick for last … low, hard, and in the corner. Even if the Brazilian keeper had guessed correctly, he never would have saved the kick (10). Congratulations Ghana and Brazil for making it to the finals. See you in about 9 months. Are You Right or Left Footed? The instructor for my E/D coaching license was Hans de Graef. Great guy. Must have been in his 60s at the time. He was recovering from knee surgery caused by a parachute accident. But he was still out there. I guess very little kept him from the soccer field. But I digress. One of the questions he asked each coach during the course was whether he/she was right or left footed? I, along with most of the other coaches answered right footed and like most of the other coaches, I was wrong. The correct answer was, “both”. To this day I still remember that question and pose it to every player I coach. Whenever I ask the question, a lot of kids will argue that ‘both’ was not an option. Had it been, they naturally would have chosen ‘both’. This may be true but on the soccer field, when young players are given the option of controlling or shooting the ball, they will often choose to play the ball with their dominant foot. Shortly after a practice or game ends, all players should participate in the collective ritual that I simply call the ‘aaaaahhhh’. Typically, ‘aaaaahhhh’ is the sound that players make when they take off their cleats, socks, and shin guards and slip on a cool pair of flip-flops. In Northern California, we can usually get away with flip-flops. But in other parts of the country and depending on the time of year, other footwear may be more appropriate. After a long, hard practice in which you have given 100% effort, you want to wind down and put soccer behind you and reward yourself for a job well done. There is no better feeling than freeing your wet and smelly feet from your cleats, stretching your toes out, and then having them touch the nice, cool grass. There is only word that can describe this feeling … ‘aaaaahhhh’. Conversely, when you put on your cleats before a game or practice, this is the players’ signal to start focusing on soccer and the job at hand. All goofing off and messing around should cease. You are now at work and ready to give 100% effort and attention. Putting on the cleats is the equivalent of a parent sitting in front of the computer at work, a fireman answering an alarm, or a teacher calling the class to order when the first-period bell rings. It is time to go to work to learn and improve. The same is true of games. When those cleats are put on, it is time to focus on the game. When the game is done, reward yourself for your effort. Getting out of your cleats is extremely important when you have multiple games in one day. After the first game, slip on your flip-flops and relax. Soccer is done for a while. Take a break. Your kids will learn that there is a time and place for everything. At practice, they should be there to learn and improve–just like at school. When the cleats come off, soccer is done. Flip-flops will save money. There is nothing that I hate worse than seeing my kids walking around the parking lot or mall in their cleats. Plus, it can’t be comfortable. For coaches, try incorporating the collective ‘aaaaahhhh’ ritual. Make sure they have your undivided attention when their cleats are on. When they are off, that is their time. Your practice should run smoother and hopefully your players will be more focused and ready for the start of a game. As a coach, referee, and fan, I am always surprised to hear some of the things that can come out of parents’ mouths during games. So much so, that there will multiple posts devoted to soccer parents. Don’t get me wrong. A vast majority of parents are very encouraging and well-behaved during games. In addition, I recognize that I am no saint. I have not always been the ideal coach or fan. And if you ask my youngest, he would say that I’m a bad soccer parent because I will tell him to hustle and on occasion ‘coach’ him just a bit. However, I know I am getting better so I do feel like a can share my thoughts with you without being considered too big of a hypocrite. As a coach and as someone who wants to improve soccer in the United States, there is nothing that drives me crazier than parents reinforcing poor play. The biggest example of this is the long ball. U.S. parents are obsessed with the long ball. When a player kicks the ball 40-50 yards down field, you will hear a chorus of ‘ooooohs’ and ‘aaaaahs’ coming from the sidelines. It does not matter where the ball goes. The player will still get lauded for his/her ‘tremendous’ kick. Naturally, players hear and like this reaction. So any opportunity they get …. BOOM! … there goes the ball accompanied by the parents’ approval. What parents are reinforcing is a type of soccer called ‘kick ball’. In kick ball, players just kick the ball as hard as they can. 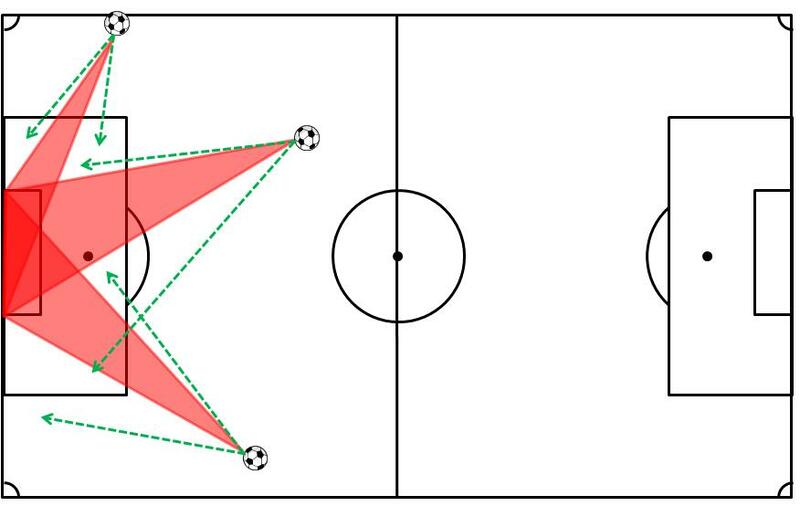 It may go in the right direction–towards the opponent’s goal–but rarely will it go to one of the player’s teammates. If you get both teams playing like this, it by no means ‘a beautiful game’. Soccer is all about the first-touch and ball control. The better first-touch (on the ball) a player has and the more control he/she has over the ball, the better the player, the better the team, and the more beautiful the game becomes. So what can parents do? A lot. But for the purpose of this post, reinforce a good first touch and good ball control. Ooh and aah when a player makes a good stop. Do the same when a player makes a good pass to a teammate. When a team starts to string together several nice passes in a row, start an ‘ole!’ cheer after each pass, as bullfighting spectators do when the matador eludes a bull’s charge. This will get the players’ attention. Remember, the first-touch and ball control are skills that take a long time to develop and can never be mastered. David Beckham and Cristiano Renaldo will be the first to tell you that their first-touch and ball control can be better. Anything that parents can do to encourage this behavior, the better. It is still OK to ooh and aah the long ball if it is done with purpose and precision. A 30-yard shot on goal is worthy of such recognition. So, too, are long punts that result in a scoring opportunity.